3ds max, combustion, Photoshop, Vray. Hi all, so long I not come to here, this is my last work for aokistudio , is fantasy forest ,all in this scene are 3ds max only few effects in combustion. Hope you like this Forest, Sorry for my English. Comment Artwork SHOW This artwork image has 32 comments. I would like to show my digital art. Realistic setting...Please let me know how I could do this. Nice pic,the girl is needed to give it form and scale, well done. Beautiful picture, but...the girl ruins it. I really love this picture, but i had it without the girl, can anyone help me please, please. I'm dying without my bosque magico. Is soo pretty! I like it. Magnifique! D'une beaut?? ?? couper le souffle! Probablement le plus beau travail, la plus belle de toutes les oeuvres que j'ai vues ?? date! This is the most beautiful work of art i have ever seen it strikes something deep iside me that i cant explain truly beautiful, great work. I bring the excellent approciated. Just bring brave colour like orange or red to giving live. yr work is excelent i love it!!!!!!! !we are fUnS of u!! these works are totally different. i've never seen anything like this before. keep it up. Fantastic, very good work! I like it. It's magic! Thanks! This image has a beautiful, full of magic atmosphere. It is a very inspirational and spiritual artwork regardless of the subject matter simplicity. 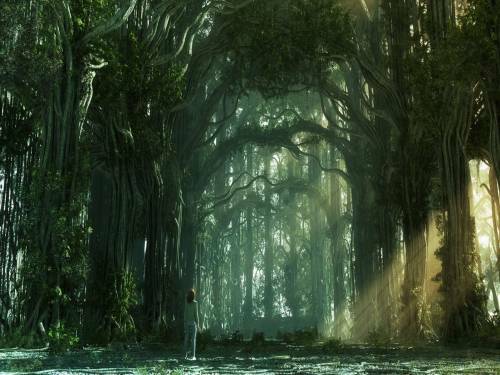 The sun light of Forest, 3D Digital Art, Nature - desktop wallpaper.